Priyanka Chopra with Parineeti Chopra at the Mumbai airport. After a handsome bridal shower, which was hosted by Priyanka's closest buddies in NY, it's time for the bachelorette party. In the second set of pictures, she slipped into a bright mustard-red sweater and a checkered skirt. It so happened that Parineeti shared a picture with Priyanka from their bachelorette trip in Amsterdam. She posted the picture with a witty caption, "Featherweight Champion of the world". Priyanka Chopra and Nick Jonas will reportedly tie the knot following both the traditions in the month of December. Well, Isha Ambani surely was a surprise for us. The happy bride-to-be shared a few photos on her Instagram account. 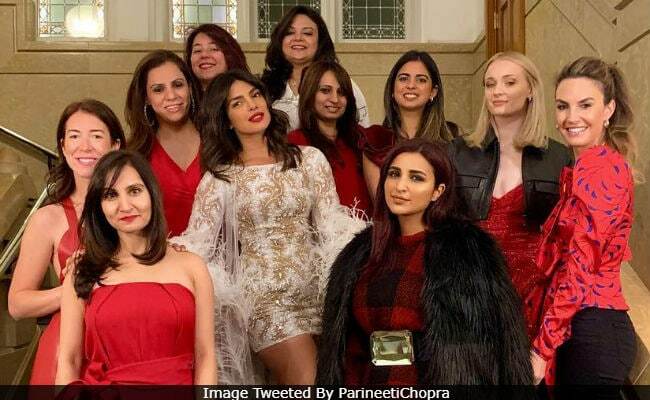 Last week, Priyanka's bridesmaids Mubina Rattonsey and Anjula Achari had hosted a bridal shower for her at Tiffany's Blue Box Cafe in New York City. On the professional front, Priyanka will be next seen in Shonali Bose's next directorial titled The Sky Is Pink which also stars Farhan Akhtar and Zaira Wasim.